Students investigate how nature can inspire engineers. Students follow an engineering process to design an underwater vehicle that can withstand both heat and cold. Adjust the size constraint for students’ capsule prototypes based on the sizes of the pots they will use for testing. Instead of or in addition to looking through a photo gallery for inspiration, take students outside to look for inspiration directly from nature. In step 10, if possible, allow students to see the materials you have gathered for use in creating their designs. In step 12, the main change to the marshmallow if it is not well protected from cold is that the marshmallow itself gets cold. Be sure students touch their marshmallow as quickly as possible after removing their prototype from the water and record whether or not the marshmallow is cold to the touch. In step 12, use safety precautions when placing the prototypes in the boiling water, removing them from the water, and opening them after removal. Let the prototypes cool down before cutting them open, and use heat-protective gloves and tongs for added safety. Depending on the students, the teacher might want to conduct this step. In step 4, be careful not to give away the animal inspiration before students have had a chance to guess. The page displays images and text making these connections, so be sure to avoid these images and text when displaying the images to students. If you use the video of the robotic arm, start the video at 1:25 to avoid giving away the inspiration. Place small, liquid crystal thermometers inside the prototypes and read the temperature before the prototypes are submerged and after they are opened to see how much the temperature changes. Some data students might include in their data tables include temperature of the water (hot/cold), condition of the marshmallow before being put in the water, and condition of the marshmallow after coming out of the water. This activity can be conducted over multiple class periods. Complete steps 1–5 in one class period and conduct the testing over a second class period. If needed, students can complete the final evaluation step during a third session or as homework. When showing the robotic arm video (start at minute 1:25) on WebEcoist, note that care should be taken not to show the image above the video, since it gives away the answer. Show two other designs from this page, taking care not to display the titles. 1. 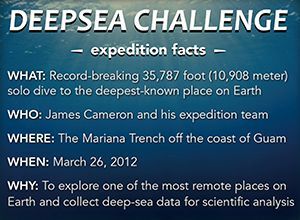 Activate prior knowledge by reintroducing James Cameron’s DEEPSEA CHALLENGE expedition to the Mariana Trench. 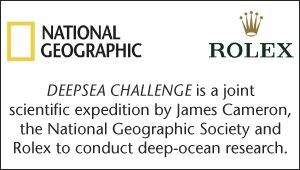 Review the DEEPSEA CHALLENGE website to refresh students’ memories about the expedition. Have students brainstorm what they remember from previous activities about conditions in the trench and about the kinds of adaptations animals have developed to survive in those areas. Ask students to rephrase some of those adaptations as problem-solution pairs. For example: no light (problem)-bioluminescence (solution). 2. Project the provided handout James Cameron’s Quote about the DEEPSEA CHALLENGE Expedition and read it with students. Discuss the quote from James Cameron. Ask: What was his motivation for designing the DEEPSEA CHALLENGER submersible? Why was designing a new submersible necessary? Explain that Cameron and his team had to engineer a submersible that was specifically adapted to explore the deep ocean. Brainstorm challenges that Cameron and his team had to address in order to explore in the hadalpelagic zone. Elicit responses that include that they had to be able to withstand 8 tons per square inch of pressure, be able to operate in near-freezing temperatures, have time to explore the bottom, and provide some sort of lighting for visibility. Have students read and discuss the DEEPSEA CHALLENGE: The Sub website to identify some of the solutions Cameron and his team of engineers came up with for these challenges. As students discuss and share ideas, create a list on the board of problems and solutions related to the expedition. 3. Ask students to describe what an engineer is and what an engineer does. Accept multiple answers from students and write them on the board. Encourage students to think about what they have read about James Cameron and the team of engineers that designed the DEEPSEA CHALLENGER. Then review what you wrote on the board and guide students to come up with a working definition of an engineer. Explain that engineers follow a general procedure to solve an engineering problem or design a solution. Distribute the Engineering Process handout and review the steps in the process with students. When reviewing step 1, define the terms “constraints” and “considerations,” and give examples of each. Constraints are absolute requirements or limitations in a design or decision-making process. If a choice or solution doesn’t meet the constraints, then it must be eliminated. For example, if you are shopping for new bookshelves for your living room, there will be a size constraint. The bookshelves must be small enough to fit in the available space in your living room. Any bookshelves that are too big must be eliminated as a choice, even if they are otherwise perfect. Considerations are desired, but not necessary, elements in a design, solution, or decision. Considerations can be used to rank choices and solutions. For example, if your living room has a lot of dark wood, the tone of the wood for your bookshelves would be a consideration; you might prefer to have dark wood so that it will match the other wood in the room. However, you wouldn’t necessarily eliminate a shelf just because it has lighter wood. 4. Introduce the idea of biomimicry through examples and a guessing game. Explain that animal adaptations like the ones students explored in the Adapting Under Pressure activity can sometimes be a source of inspiration for engineers who are trying to solve a particular design challenge. Open the provided Humpback Breaching webpage and read aloud to students the last bullet point, which explains how the whale is an inspiration for cutting-edge technology. Discuss what biomimicry is and why looking at examples from nature might be helpful to engineers. Divide students into small groups. Display three examples of biomimicry from the provided WebEcoist: Brilliant Bio-Design webpage, and have students work with their groups to identify the inspiration from nature behind these designs. 5. Focus students’ attention on one of the engineering challenges faced by James Cameron and his team. What heat-related problem did James Cameron face in early dives? What caused the problem? What effect did the heat have on Cameron? What solutions did he and his team come up with to address the problem? Show the "105 Degrees" video and have students use the focus questions to take notes as they view the video. Then have students read the description of the dangers from extreme temperatures faced during the DEEPSEA CHALLENGE dive from the provided DEEPSEA CHALLENGE Expedition Risks and Dangers website. Discuss the focus questions and the reading as a class. 6. Have students make observations about the effects of extreme heat and cold on a marshmallow. Place a large marshmallow in boiling or near-boiling water for about 30 seconds to one minute. Spoon the marshmallow out of the water and show it to students. Ask students to make observations about what happened to the marshmallow. Students should observe that the marshmallow melted or got smaller. Place another marshmallow in ice water for 30 seconds to one minute and then pass it around to students. Have students make observations about what happened to the marshmallow. They might observe that it shrank slightly, and they should definitely observe that it became very cold to the touch. Explain that students will be using marshmallows as stand-ins for explorers in an engineering challenge of their own. 7. Have students redefine the problem statement. Challenge students to work in small groups to come up with designs inspired by nature that will protect their explorers (represented by the marshmallow) from extreme heat (boiling or near-boiling water) and extreme cold (ice water). Read aloud to students the problem description section of the Problem Scenario: Engineering Inspirations handout. Explain that students will use the Engineering Process handout they were given earlier to guide them through the process as they plan, design, and test solutions to the problem presented in the scenario. Working in small groups, have students define the problem in their own words per step 1 of the Engineering Process handout. Invite groups to share their problem definitions with the class, and then go over the problem definition provided on the Problem Scenario: Engineering Inspirations handout. Briefly review the concepts of constraints and considerations. Have each group list constraints and considerations for the problem scenario. Have groups share their ideas with the class, and then provide the final list of constraints for the problem as listed on the Problem Scenario: Engineering Inspirations handout. 8. Have students conduct research that will help them solve the problem. Explain that students should utilize biomimicry and look for inspiration from nature to help them solve the problem. Have each group brainstorm questions they have, information they need, and keywords and topics to use in their research to solve the problem, and have them list these per step 2 of the Engineering Process handout. Have students use the provided National Geographic Animal Photo gallery to look for inspiration. Also allow time for them to conduct research about any other information they identified as important to their solutions. Have students summarize the results of their research and describe their inspirations from nature per step 2 of the Engineering Process handout. 9. Have students propose solutions. Have students review the problem, including the constraints and considerations they identified. Students should then propose solutions based on inspiration from nature and describe their solutions per step 3 of the Engineering Process handout. Encourage students to be specific and thorough in their proposals. 10. Have students develop designs. Have students draw detailed designs for their proposed solutions as described by step 4 of the Engineering Process handout. Have them label their designs, include possible materials, and make any other notes necessary for clarity. Ask students to describe how they think their designs will work to solve the problem. 11. Have students build prototypes. Provide students with materials such as small soda bottles, medicine bottles, small lengths of PVC pipe, a variety of insulating materials (foam pipe insulation, bubble wrap, packing peanuts, etc. ), waterproof duct tape, conductive materials (such as aluminum foil), rags, sponges, and other available materials. Have students build prototypes of their designs using these available materials. Remind students of the size constraints for the prototypes. Have students list the materials they use, including amounts, per step 5 of the Engineering Process handout. Have them include step-by-step instructions for how to build the prototypes. Point out that these instructions must be specific and thorough enough that someone else could use them to replicate the prototypes. 12. Have students test the prototypes. Describe the basic testing procedure to students. Tell them that each group will first immerse their prototype in hot water and then open the prototype and check the status of the marshmallow. They will then use the same prototype to repeat the process in cold water. Tell them that a test using a successful prototype will show no effect on the marshmallow. However, if their marshmallow is altered after the first test they can use a new marshmallow for the second test. Have students specify how they want to conduct the tests per step 6 of the Engineering Process handout. Ask: How will you open the prototype after it is removed from the water? How quickly will you need to open the prototype after it is removed from the water? Have students list the data they need to collect in order to evaluate their solutions and describe how they will use the data to improve their designs. Have students create tables to record the data for each test. Have students conduct the first test in hot water and record their data. Because prototypes will need to be opened in order to check the effects of the test on the marshmallow, students will need to repair the prototypes or use the information they recorded to build identical prototypes for use in the next test. Have them test the prototypes in cold water and record their data. Have students use the data they gathered to evaluate the success of their designs. Have them determine what, if any, changes need to be made to their designs to solve the problem. Give students time to re-make their prototype and make any adjustments needed. Then have them test again. Provide students at least three opportunities to adjust and re-test their prototypes. Make sure they record detailed data for each test, including any adjustments made to their designs. Have students write summaries of their test results and the adjustments they made based on those results. 13. Have students evaluate their final designs and the engineering process. Have each group present a summary of their design and testing. Discuss the engineering process the students followed and analyze why some designs worked and others did not. Ask: What kinds of materials were used in the successful designs? What functions did those materials serve? Tell students that they will write a reflection of the process they used to solve the problem presented to them. Distribute the Reflection Rubric to each student and review the criteria you will use to assess their written reflections. Tell students to refer to the Engineering Process handout and any other notes they took to write their reflections. Explain that the reflection should include a summary of the problem they had to solve, an explanation of how their design was inspired by nature, and an evaluation of how well their design worked, including what they would change to make it work better. They should then compare what they did in this activity to what an engineer does. Observe students as they design, plan, and conduct tests to make sure they are following each step of the engineering process. Use the provided Reflection Rubric to assess students’ final written reflections. Set up a testing station that can be closely monitored for safety when testing in hot water. An engineer is a person who applies a wide range of science knowledge and skills, problem-solving, information technology expertise, and mechanical expertise to design and build complex products, machines, systems, or structures. Engineers are problem-solvers. Engineering has given us many of the systems and products we rely on daily. Items such as the cars we drive to school, the computers on which we do research, and even the complex systems that bring water and electricity to our homes were all engineered. Engineers apply a wide range of science knowledge and skills, problem-solving, and information technology and mechanical expertise to design and build complex products, machines, systems, or structures. Engineering often involves complex designs that have to be broken down into smaller chunks and problem-solved. For example, the DEEPSEA CHALLENGER submersible is made of many parts, including the body design, the mechanics involved in moving the submersible, the communication systems, the cameras and lighting used for exploration, the safety systems, and much more. James Cameron and his team had to address each of these parts of the DEEPSEA CHALLENGER to optimize it for its mission to explore the deepest parts of the ocean. a matter weighed or taken into account when formulating an opinion or plan.